Jerry D. Worsham II is a shareholder with the firm. Mr. Worsham has an extensive practice in environmental compliance and litigation, natural resource development. 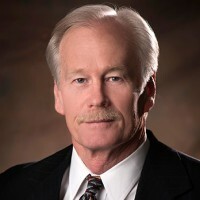 His experience includes: approvals and permits for natural resource development; litigation defense on numerous cases involving the Comprehensive Environmental Response, Compensation and Liability Act (CERCLA); Climate Change including comment on issues and regulation development; compliance with the Resource Conservation and Recovery Act (RCRA); civil and criminal liability defense on environmental matters; ASTM Phase I and Phase II Environmental Site Assessments coordination; emergency incident responses; Prospective Purchaser Agreement negotiations; creation of Conservation Easements; and due diligence associated with mergers, acquisitions and initial public offerings. Mr. Worsham reviews and comments on federal, state and local laws, rules and regulations on a regular basis and represents clients before federal and state environmental agencies. Negotiation of a Consent Agreement and Final Order (“CAFO”) with the Environmental Protection Agency (“EPA”) concerning alleged violations of the EPA’s Lead Renovation, Repair and Painting Rule including a Supplemental Environmental Project (“SEP”). Negotiation of a Tolling Agreement and a Consent Decree with the EPA for a CERCLA Site. Remediation of a Shopping Center with contamination by a former Dry Cleaner tenant. Completion of Environmental Due Diligence Associated with a Solar Energy Project. Successful Legal Defense of an Apartment Complex with allegations by tenant of Mold Contamination. Completion of a Voluntary Remediation Program (“VRP”) application with the Arizona Department of Environmental Quality (“ADEQ”) for a commercial property. Obtain a Prospective Purchase Agreement (“PPA”) with the ADEQ for a new Apartment Complex within an Arizona Water Quality Assurance Revolving Fund (“WQARF”) Site. Senior Member Jerry Worsham II was appointed to a national steering committee for the Associated General Contractors of America-AGC’s Environmental Forum. Members are selected from throughout the construction industry and serve a rolling three- year term. Jerry Worsham’s practice focuses on environmental and natural resource issues. He is licensed to practice in Arizona, New Mexico, Texas and the District of Columbia.